The FH Series sealed push button switch offers a small but robust package size of 12mm. Panel mount style, the FH Series is heavy-duty and rugged in construction, both splash and vandal resistant. This 12mm push button switch is available with a choice of flush or raised actuator styles, non-illuminated, bi-color ring illumination or dot illumination. Finish options are brushed stainless steel and anodized aluminum in black, green, red, blue and yellow. 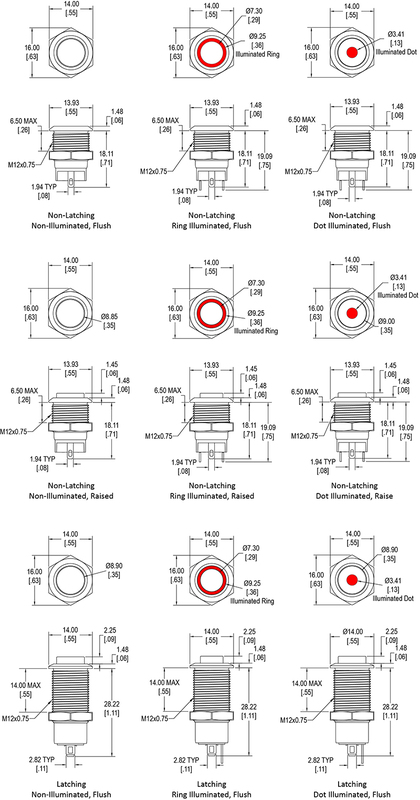 The FH Series is a spst momentary switch. Bi-color illumination choices for this anti-vandal switch are red, yellow, green, blue, white and orange.